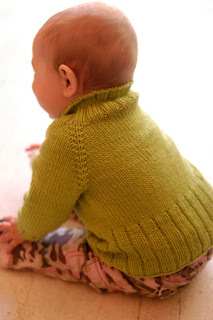 This unisex baby sweater is a great introduction to top down knitting. Knit in one piece it's an easy, quick knit with very little finishing. The size shown is 6-12 months. I used about one and a third skeins of Cascade's Venezia worsted (@315yds) with a #8 16" circular. I used that size needle for the whole sweater and added a second 12" #8 for the sleeves instead of DPN's. The gauge: 5sts=1" although the gauge isn't super important on this one. Generally I've found that most people tend to make this a little on the big side, which for yourself you might not want but for the little ones a little bigger never hurts. My new fave for baby showers! 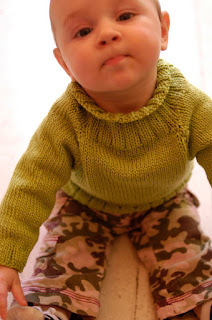 Very quick to knit up.